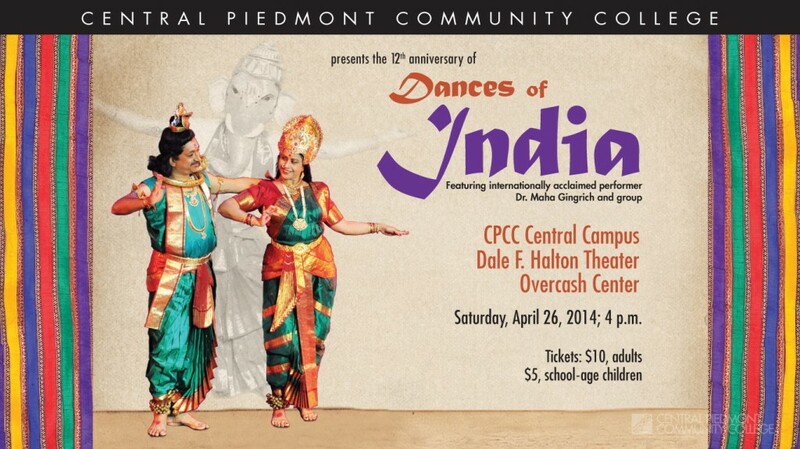 Click on this photo to view an online video about "Dances of India" at CPCC! “Dances of India” is excited to return this year to CPCC’s Halton Theater stage on Saturday, April 26 at 4 p.m.. For 12 years, Dr. Maha Gingrich has created a performance that has celebrated the history and culture of India through dance, bringing 3,000-year-old art forms to today’s audiences. This year’s performance will explore the world of martial arts and how India’s many classical dances, such as Kuchipudi, Bharatha Natyam and Kathak, have influenced the practices we know today such as Yoga, Kung Fu, Kali and others. Audiences will delight in watching as the dances show the many similarities between Indian dance styles and other international dances, especially during the show’s signature dance, “Unity in Diversity,” set to live orchestral music. Audiences won’t want to miss this special event which strives to connect Indian dances to the world through a series of striking dance dramas that feature unique props, silk costumes and a compelling narrative. Date/time: Saturday, April 26 at 4 p.m. Under Gingrich’s direction, Dances of India has received a number of accolades, including being named one of the top nine memorable events among the nation’s community colleges by Community College Week. Gingrich, who danced professionally in her native India, has been teaching dance in Charlotte since 1986. Trained in three different dance traditions, she has a great love for this dance form and keeping the heritage alive in this community while sharing the message of unity in diversity with residents at the regional level and beyond. Click this image to purchase Dances of India tickets now! This entry was posted in Arts, Central Campus, Events and tagged Bharatha Natyam, dance, Dances of India, diversity, Dr. Maha Gingrich, halton theater, India, Kali, Kathak, Kuchipudi, Kung Fu, Maha Gingrich, martial arts, Yoga by Mallory Benz. Bookmark the permalink.